In what can only be described as a strange coincidence, the two people responsible for the biggest Oscar fail in history recently gave an interview discussing what would happen if the wrong winner was announced at the awards. In a prophetic interview with the Huffington Post days before the ceremony, two Price Waterhouse Cooper employees, who are the only people to know the results of the Oscars in advance, admitted they were unaware of the procedure if the wrong name was called out at the awards. Martha Ruiz, a tax adviser and Brian Cullinan, an accountant and chair of PwC’s US board, oversee the counting procedures and possess the winners’ list long before the winners are announced. “Again, it's so unlikely,” he added. Once, you jinx an event with such a level of confidence, however, a mistake is always likely to happen. And, in this case, reverberate around the globe. Roll around the Oscars. 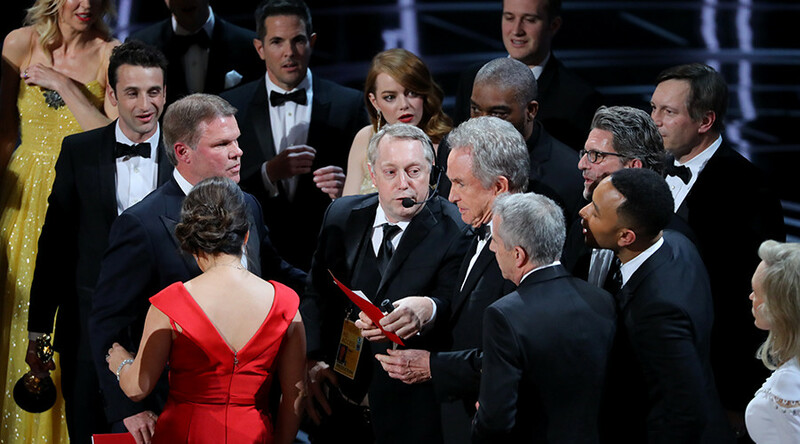 Warren Beatty and Faye Dunaway present the Best Picture award to ‘La La Land’, instead of the actual winner, ‘Moonlight’, after seeing, ‘Emma Stone, La La Land,’ written on the card. To make matters more embarrassing, the PwC pair had also detailed in the earlier interview the process they undertake to ensure no mistakes are made. “It’s him checking me and me checking him, and we do it multiple times against each other to make sure that when we leave and are ultimately handing the envelopes to someone, we’re very confident they’re getting the right envelopes and the contents in them are accurate,” Ruiz said. PwC has apologized for the mistake in a statement, which has been met with a high dose of online trolling. “We sincerely apologize to ‘Moonlight’, ‘La La Land’, Warren Beatty, Faye Dunaway, and Oscar viewers for the error that was made during the award announcement for Best Picture,” the statement said. @PwC_LLP Dear PwC, I would like to apply for the newly vacant role of envelope giver at the #Oscars.I can read and am alive.I await the job! @amancaytapia@PwC_LLP Jesus, they've just apologised, what else do you want them to do? Perhaps a public firing of the envelope mishandler?